Europa Plus Live, a large music festival held at Moscow’s Luzhniki Stadium in July, marked the Russian debut of HARMAN Martin’s new M6 lighting console. 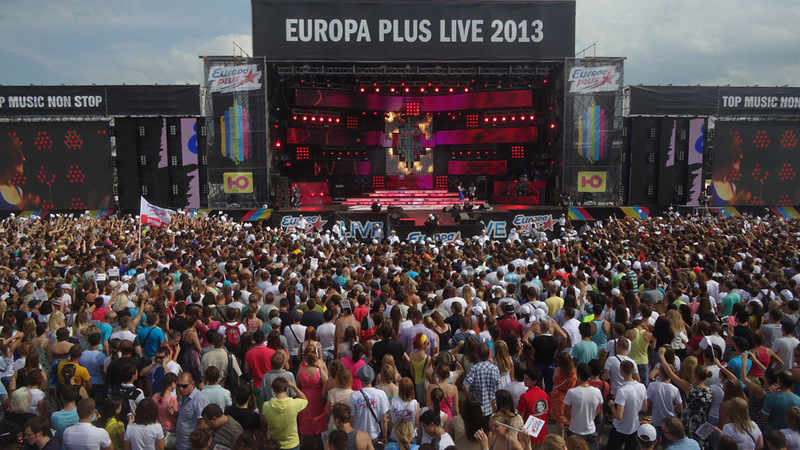 One of the most important music events of the Russian summer, Europa Plus Live featured performances by popular foreign and Russian artists and attracted over a hundred thousand people. Stage design was by Alena Morozova with lighting design by Alexey Zhuravlev. For the fourth year running, Euroshow provided full technical support, which included supply of a large Martin MAC rig. A day after arriving at Martin’s Representative Office in Russia, the M6 was sent to Luzhniki Stadium as the main lighting console on the festival. The day before the event, lighting designer Alexey Zhuravlev patched the rig on a Martin M2GO console, which allowed him to minimize prep time on site. Amazingly, he began programming at 9:00 pm on the eve of the show. He continues, “When I decided to use the M6 on Europa Plus Live, I wanted a tool that could solve all the difficulties that arise during such an intense programming process. I needed a controller that allowed me to effectively lay out the effects and work with all the processes more operatively. The M6 met my needs completely. I really like the way of ‘grouping tools,’ as well as the built-in effects generator; both of them helped a lot. Zhuravlev also had praise for the console’s well-thought-out structure of features such as faders, padding buttons and especially the console’s sunlight-readable BriteTouch screens. The younger brother to the M6 in Martin’s M-Series, the compact M2GO, was an additional console used on the festival. Alexey Sokolov, Euroshow video engineer and assistant to Alexey Zhuravlev, had never worked with an M-Series console before but found it took only five minutes to understand its structure and begin programming. The M6 handled a huge Martin lighting package which included 112 MAC 101, 44 MAC Aura, 6 MAC 401 Dual, 34 MAC 301 Wash, 10 MAC 2000 Wash XB and 16 MAC Viper Profile moving heads, along with 42 Atomic 3000 DMX strobes equipped with Atomic Colors scrollers. As the festival took place during daylight hours and it was therefore not possible to use many of the traditional concert lighting tricks, Zhuravlev played not with light and effects but with their sources, which became an integral aspect of the visual design. LED-based MAC Auras were placed on several truss lines as main sources of background light, providing general wash light on stage, and also used them for decorative looks via the fixture’s unique backlight illumination. Another creative design element was several MAC 101 “chandeliers,” clusters of 16 of the compact LED fixtures on special metal constructions and used to highlight key points of the show.